It has been over 30 years since Alien first appeared in theaters in 1979. Since that time, quite a number of movies had enriched the overall universe of this story as handled by various directors across different movies and even a number of novels and comic books. But all that time, director Ridley Scott had never returned to his creation despite the amazing fan following it has developed over the years. So naturally a lot of fans were excited when news broke out that Scott was interested in working on a prequel to his initial masterpiece of science fiction horror. Now prequels (and sequels for that matter) tend to be quite the mixed bag in terms of quality and it's not often the case that all these additions to the story really help things along. But I think it's fairly safe to say that Prometheus is a pretty powerful piece that does well to stand on its own and yet still contribute to the original franchise. Do you need to see the original Alien to enjoy this movie? Surprisingly my initial answer is no. You're good enjoying this movie on its own and focusing on the implications of this one story alone. Synopsis: Prometheus is a 2012 science fiction movie directed by Ridley Scott with a screenplay by Jon Spaihts and Damon Dindelof. The movie starts far back in Earth's early history when the planet is largely without life. A mysterious alien figure with almost marble-like skin stands alone as a space vessel leaves. He ingests something and starts to break apart, his genetic material somehow forming the basis for life on this planet. Later on in 2089, we meet archaeologists Elizabeth Shaw (Noomi Rapace) and Charlie Holloway (Logan Marshall-Green). They make a surprise discovery in the Isle of Skye that indicates ancient cultures around the world all have accounts of giant beings and a configuration of stars that seem be consistent across their graphical depictions. Fast forward to2093 and the crew of the Prometheus have arrived at their destination - a system that best matches the depictions in the ancient records. Most of the crew have been in hypersleep all this time to slow their aging across the long journey - all except the artificial lifeform known as David (Michael Fassbender). The crew is awoken and briefed on their mission by Meredith Vickers (Charlize Theron), who represents the interests of the Weyland Corporation that funded this expedition. The team will now go investigate the moon where they suspect these "Engineers" have come from to find the answers to their questions about the origins of humanity. Now as much as this is a prequel to the Alien movies, it's important to note that the movie doesn't focus too much on our favorite xenomorphs. Instead of constantly being on the run from those ultimate killing machines with acid for blood, we instead focus what most fans have termed as the "space jockey" - an alien figure only briefly viewed in the first movie. And this does make for an interesting point of focus. The movie has a lot of homage echoes to the original film that started it all. We have the android crew member that's somewhat hard to trust. We have the representative of the corporation that people instinctively don't like. And we have the long build-up to the final horrors towards the end of things. The major kudos for this movie definitely have to go out to Michael Fassbender, who did a remarkable job of bringing the android character of David to life. His performance is absolutely surreal given the balance of very little emotion, movements that seem human and yet just slightly off somehow and of course his seemingly near-perfect nature. It's interesting how just having him in the scene is enough to weird one out and make you think things just aren't quite right. So yes, hats off to you again Mr. Fassbender. The story did have its share of trope-y, predictable moments, which is inevitable in a movie that opts to be an homage to an earlier piece or just demonstrates somewhat older science fiction sensibilities. There are a number of "reveals" in the movie, although the foreshadowing for said reveals felt a tad heavy-handed in my opinion. Or maybe I've just seen far too many science fiction movies in my time. 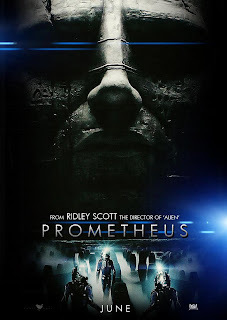 Still, Prometheus is a great movie and one of the better serious science fiction pieces we've seen in a while. It focuses a lot more on the drama instead of action-packed sequences, except for a few weird moments here and there. The movie still rates 4 proto-xenomorph cameos out of a possible 5.